Once upon a time, in a conservative, Southwestern Ontario city, there lived a women who loved hats. She loved looking at hats, the more dramatic and unusual, the better. 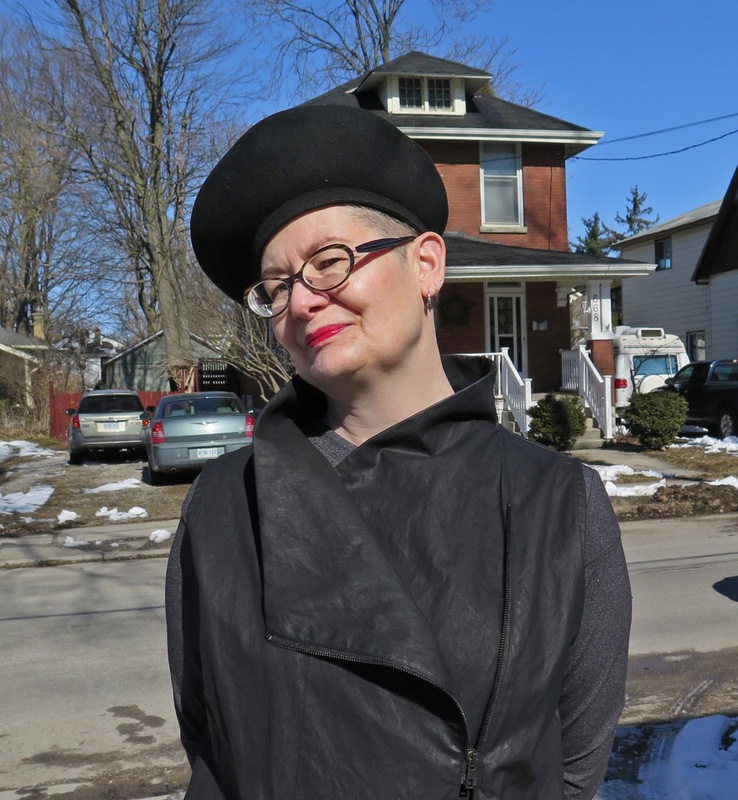 She loved to see other women wearing hats, and had several friends who lived in other cities who wore hats every day. When she travelled, she enjoyed visiting hat stores and vintage shops where she would try on hats and picture herself wearing them on the weekend, or on an evening out. She wanted to be one of those women who wore a hat with confidence and panache. "This is the one!" she would think, the one that I WILL wear, only to take it home and find that it sat on the top of her wardrobe, or in a hat box, admired, but unworn. It turns out that she loved the idea of hats, and what they represented, more than wearing the hats themselves. Occasionally, she would find a hat that was simple, but still had a bit of drama, went with many of her outfits, and did not make her feel uncomfortable or self-conscious when she wore it. 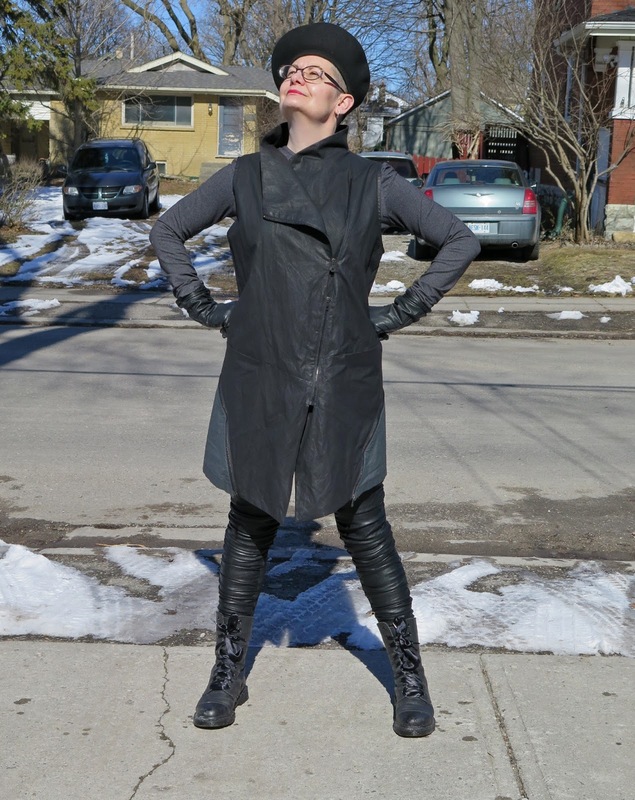 Enjoying some sun on my face, wearing some of my favourite black and grey pieces. Waxed cotton vest and faux leather leggings from From Mars, ribbon-laced Doc Martens purchased in New York. These photos were taken at the end of February when we had a brief spell of very spring-like weather, and I could get away with wearing a lighter coat. 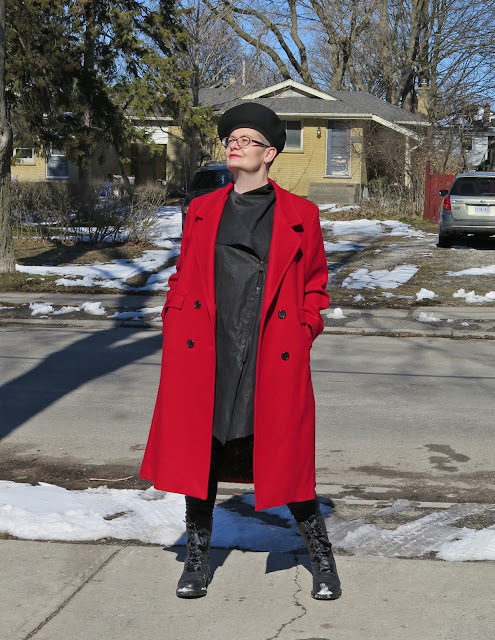 I found the vintage wool coat at Blue Pepper Vintage closing sale. There was either something very interesting going on in the sky to my right, or, more likely, I discovered that if I tilt my head upwards, it gets rid of that annoying "soft and wrinkly" neck in my photos. I was thrilled to learn that Canadian poet bill bissett was going to be in London to do a reading at one of our local branch libraries. bill and I have known each other for about 30 years, and while we don't see each other very often, he has always been one of my favourite people. He has a sweet and gentle spirit, a lovely sense of humour, and for all the challenges (including a severe head injury in the 1960's, and two recent heart surgeries) he has faced in his life, retains a positive and optimistic outlook. 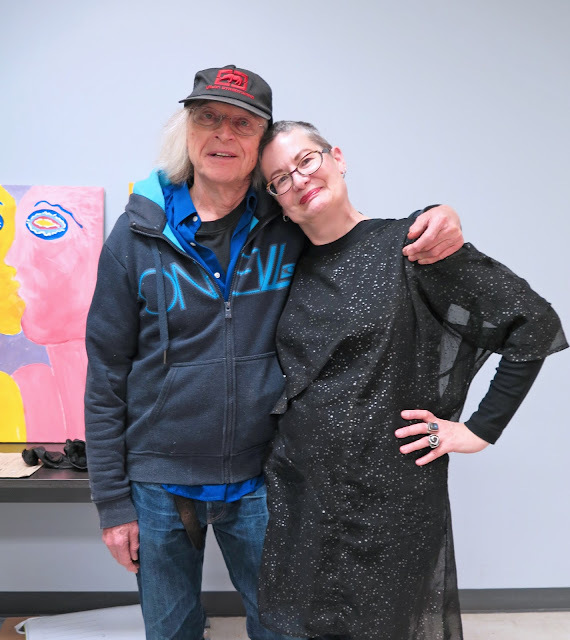 bill, whose sound and concrete poems at one time earned him praise from Jack Kerouac, is the author of more than 60 books of poetry, and is also a painter and musician. His poetry can be challenging to read as he has abandoned all use of capitals, punctuation, and conventional spelling, but it is a joy to listen to him read his own work. You can find the words of one of the earliest poems I every read of his, "Cooking Carrot Soup" here, and there are several videos of him reading his poetry on Youtube. I was contacted by a representative of Calla Shoes, a start-up company in the UK that sells stylish shoes designed specifically for women who have bunions. The founder of the company, a woman who has bunions herself, wanted to provide heels were both stylish and comfortable to wear, and that protect and conceal bunions. They noticed I mentioned I suffer from bunions in one of my blog posts, and offered me a pair of shoes from their website to try them out. 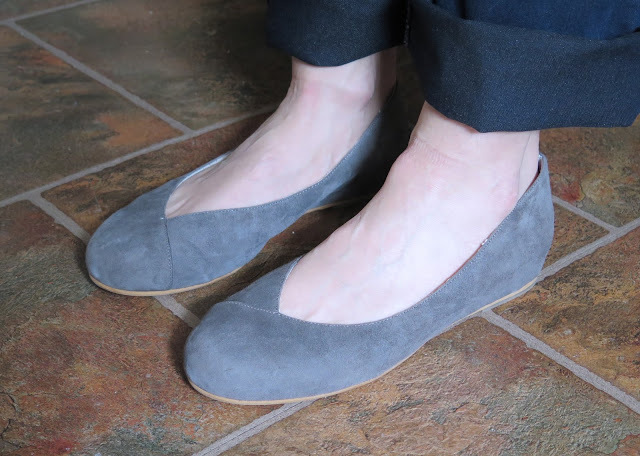 Since I don't wear heels, and for now, the two styles they carry are heeled pumps and ballet flats, I went with a pair of grey suede ballet flats. The shoes arrived from the UK in record time, beautifully packaged. They are a nice looking shoe, with a comfortable cushioned insole, and they fit, in that the wider front did accommodate and conceal my bunions, but unfortunately, because my foot is also fairly wide in the middle, the sides of the shoes bulged and my foot slipped out when I walked. I have never been able to wear ballet flats because of the shape of my feet, and the need for more support than they provide, and I was hoping these might be the exception to the rule, but alas, not. I contacted the company to get instructions on how to return the shoes, and they generously suggested I gift them to someone else. As it happens, they fit my bestie's feet perfectly (she and I both wear a size 10, but she doesn't have bunions), and she quite liked them, so they found a good home after all! Thanks very much to Calla Shoes, for letting me try their product, and for letting me re-gift them. If you have bunions and haven't been able to find heels that you can wear, take a look at their website. What a fabulous chapeau! It is really you, Shelley. I went "Whoa!" when I saw that waxed vest and those are faux leather leggings? They look like real leather, and you look like a badass (in the best way) in them. Wow, you know bill bissett? That's awesome. There's a book called "Feersum Endjinn" by Iain Banks, with a character named Bascule who speaks in the book like bill writes. I had to read his dialogue under my breath as I read the book - it was wondrous, and really unleashes the power of language so playfully. At least the shoes worked for someone! Hearing a poet read their work is the best. How wonderful that you got to meet an artist you love. It always adds more meaning to their work. Love that bold red coat and statement hat! Shame about the shoes. Diva feet are hard to please. I have the same issue with my feet walking out of shoes and requiring support. Hah! Diva feet. Yup, that’s what I have too. No bunions but definitely very particular about comfort. Too bad they weren’t for you, Shelley, but glad you were able to find those shoes a good home. Ooh, and I love your hat too! woww, you look particularly fabulous wearing your 'structured beret', it's a really cool and edgy hat and perfect for your genuine style. I do love your red coat too, and all those different textures in your outfit, brilliant! and those boots! So lovely that you could met such an interesting person (and poet! ), I like how his poems sound and the (apparent) simplicity. I have to listen more of these poems! Glad that there's a Company selling stylish shoes for bunions, and glad that the shoes found a good home!. Curiously, bunions is the one and only foot problem I have not, but I'll share this with my mom and friends! You really do rock a hat! That's a wonderful structured beret and the red coat is so cool. How brilliant to hang around with your poet friend, you look great together. I shall click on that link and have a listen to his work. Your hat is very cool and your striking poses of power that go with it! Not to mention the ensembles fit for Wonder Woman. How fun to have a reunion with the poet from way back when. Does he still live in the hood? hmmmm. Glad your shoes found a good home so easily. Yeah, I find ballet slippers are usually too narrow and the heel is often to low for comfort. But very nice that they singled you out to send a pair to you. This is definitely a hat that ticks many boxes - it has drama and you're comfortable wearing it. It truly looks smashing. And I love how your red coat brings a whole new vibe to this outfit. As for Calla Shoes, that's a disappointment, but at least the company gave you stellar service and your bestie will now gladly show them off. We need a potion that says bunion be gone!! And bill bissett, I think of him regularly because there is a plaque in his honour in downtown Vancouver, which I pass by almost on a regular basis. I didn't know you know him, so that's a fun fact. This is a great shot of you guys together!